Challenge One major challenge for transcranial FUS is propagating the ultrasound through the skull; the varying thickness of the skull causes beams traveling from different paths to not add constructively, resulting in changes to the location, shape and intensity of the beam’s focus. Figure below shows the beam patterns in a homogeneous medium and through a human skull without correction of these aberrations. Currently, an x-ray Computed Tomography (CT) imaging-based correction technique is used to correct for the aberrations produced by the skull. However, the use of CT introduces an undesirable radiation dose and co-registration concerns between the two imaging modalities (since MRI is used for treatment guidance). Other Techniques Present MR-based techniques manipulate each transducer element’s phase to maximize the focal intensity; this results in 3 measurements per element for a total of 3000 images and takes a long time (3 hours) for one correction. Further, these measurements must be repeated each time the focal spot is moved to a different location in the surgery. Work For my postdoctoral work at Stanford, I worked on a technique that eliminates the CT component of the surgery, while dramatically reducing the number of MR measurements required from 3000 to just one. 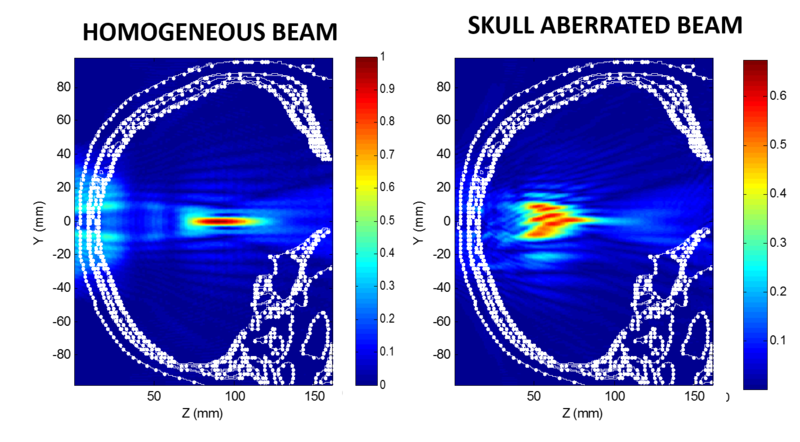 I implemented a hybrid simulation-MR imaging technique, where the aberrated MR focal image is used as an experimental measure of aberrations and acoustic beam simulations are used to model aberrations that are most consistent with the experiment. In other words, an optimization routine iteratively modifies the modeled aberrations to match an experimental MR image. 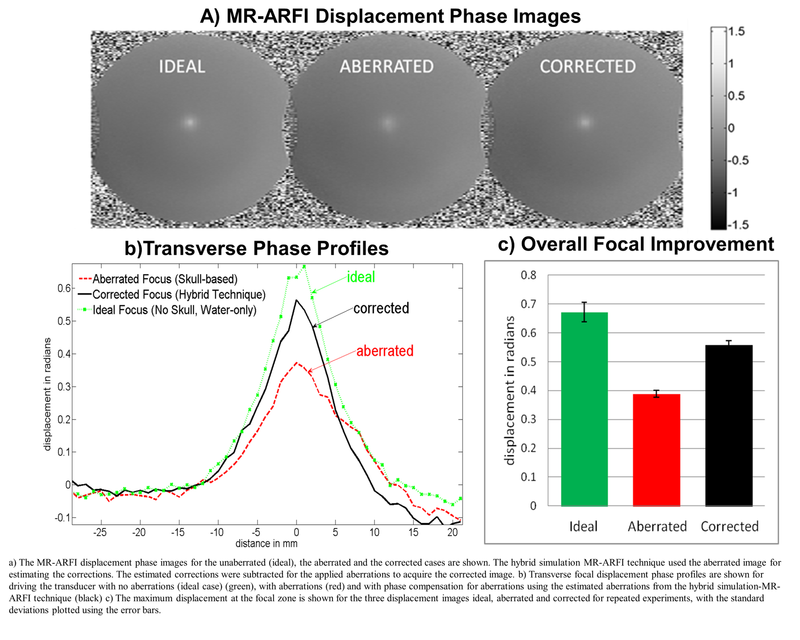 Preliminary results shown below demonstrate that we can improve the focal intensity by 80% using this hybrid simulation-MR approach using only one MR image. The technique would eliminate radiation dose of the tcMRgFUS treatment and correct for aberrations both due to skull shape and acoustic heterogeneities thus improving targeting accuracy, efficiency, safety, and clinical viability to a pediatric population of MRgFUS for treatments in the brain. Focal spot improvement with one ARFI image.